Quiet Mornings is a one-of-a-kind event, pairing a guided meditation exercise with the opportunity to experience a truly unique, immersive artwork. After an acclaimed run at MoMA in NYC, our partner Flavorpill is bringing the inspiration to LA. Join us for Quiet Mornings LA on Saturday, March 10 at The Geffen Contemporary at MOCA in Little Tokyo. Enjoy The Theater of Disappearance, Adrián Villar Rojas’ powerful site-specific work, and a group meditation session led by artist Noberto Rodriguez. A lively panel of Southern California coffee experts discuss important developments in the region’s coffee landscape, beginning with early settlers who packed green coffee in their covered wagons and roasted the beans over a nightly campfire to sustain their difficult cross-country journeys. Topics include the rise of local commercial and specialty roasters and coffee houses spanning the 20th century. Finally, the panelists explore the arrival of coffee’s Third Wave and highlight the proliferation of espresso bars and cafés that dot the map of Southern California today. On the Eastside Babylon tour you’ll discover fascinating, little-known neighborhoods and the grim memories they hold. Come visit Boyle Heights, where the Night Stalker was captured. Roam the hallowed lawns of Evergreen, L.A.’s oldest cemetery and home of some most unusual burials. Visit East Los Angeles, where a deranged radio shop employee made mince meat of his boss and bride–and you can get your hair done in a building shaped like a giant tamale. Explore the ghastly streets of Commerce, where one small neighborhood’s myriad crimes will shock and surprise. Visit Montebello, to get your heart broken by a horrifying case of mother love gone haywire. All this, and so much more on Eastside Babylon, Esotouric’s exploration of L.A.’s most horrifying forgotten crimes. In 2010, the late, great television personality Huell Howser telephoned filmmaker John McDonald to make an unprecedented request. Howser had seen McDonald’s documentary, The Ghost Mountain Experiment, a story about a family who lived off the grid for seventeen years in San Diego County’s Anza-Borrego Desert, considered this story to be quintessential California’s gold and wanted to make an episode based both on the Souths and on McDonald’s fine documentary. Due to Howser’s unexpected illness and untimely death as well as the cancellation of California’s Gold, Howser instead gave McDonald the unedited video master of this episode. McDonald completed the editing of Huell’s work and he will screen share with us this last nugget of California’s Gold! Discover art, architecture and spaces not generally open to the public in an exclusive free tour of Union Station Los Angeles. Begins at the information booth inside the Alameda Street entrance to historic Union Station. The tours are free. No reservations required.Led by Metro Art Los Angeles Docents, the tour covers Union Station art, architecture and spaces not generally open to the public, including the Historic Ticketing Hall. Additionally, the tours explore artworks located in the Gold Line Portal, Union Station East and inside the Metro Headquarters Building. A couple weeks ago, my coworker and coffee connoisseur Heejae and I discussed the process and craft that goes into making a good cup of coffee. As new coffee shops and coffee roasters pop up across the city, we wondered exactly what it is that sets each apart? We talked about where different beans are grown, various varieties of the coffee beans themselves, styles of roasts, and even the signature style of individual baristas preparing each cup. Of course, this discussion about craft eventually segued into parallels with our profession as landscape architects “crafting” landscapes through the process of design. A misty morning in Frederick Law Olmsted’s Prospect Park in Brooklyn is evidence of crafting an experience for visitors with carefully placed elements, trees, boulders, benches, that meticulously frame a space. As silhouettes appear and elements disappear, Olmsted’s intentional and deep understanding of space directs the viewer to how he envisioned the landscape. Whether a pastoral or an urban project, landscape architects are perpetually crafting experiences this way. Enrique Miralles is another amazing talent gifted in crafting the landscape experience. 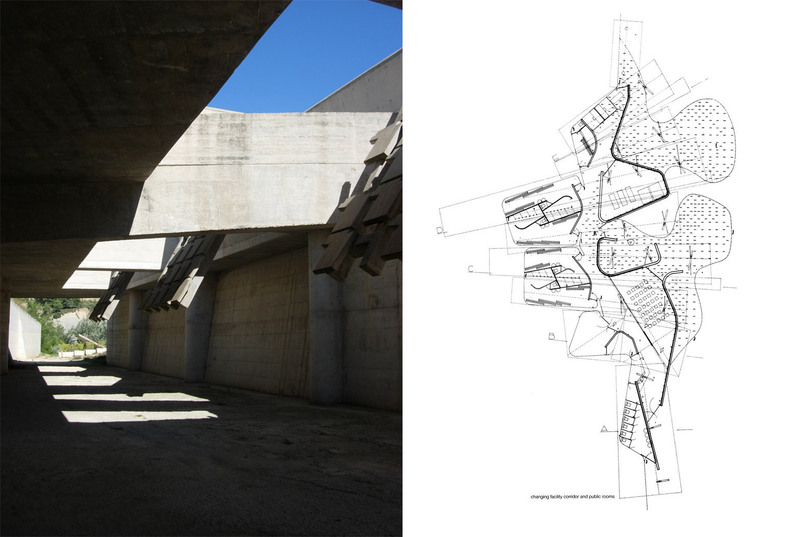 His drawings of Igualada Cemetery illustrate both the complexity and simplicity of the interconnected space, where cast concrete tombs and paving patterns work in intricate collaboration. Miralles utilized excavation and concrete work to provide a unique and enclosed experience of a landscape dedicated to the buried and their visitors. Roberto Burle Marx and Le Corbusier both incorporated painting in their exploration of space and form. Whether an intentional plan or a painting, Burle Marx’s craft and style is incorporated into his landscape with bright colors partnered with amazing forms. His craft extended into the palette of plants – uniquely so – utilizing flora to create a distinct flavor. Similarly, Le Corbusier also used paintings to explore ideas of scale, color, form and theory, in the process putting forward his visions of design still appreciated and studied today. Taking this idea of craft – whether in preparation of a cup of coffee or while designing a landscape – its practitioners strive to take the technical understanding of their work, perfect their style, and produce something memorable and amazing.